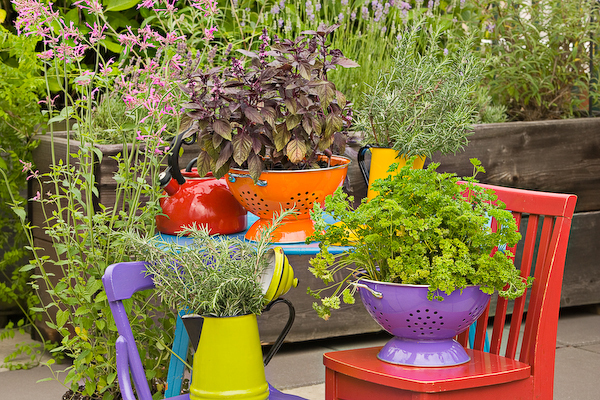 Use some of the things that you're about to throw away to create imaginative recycled planters for your garden. It'll add a unique touch to your garden. 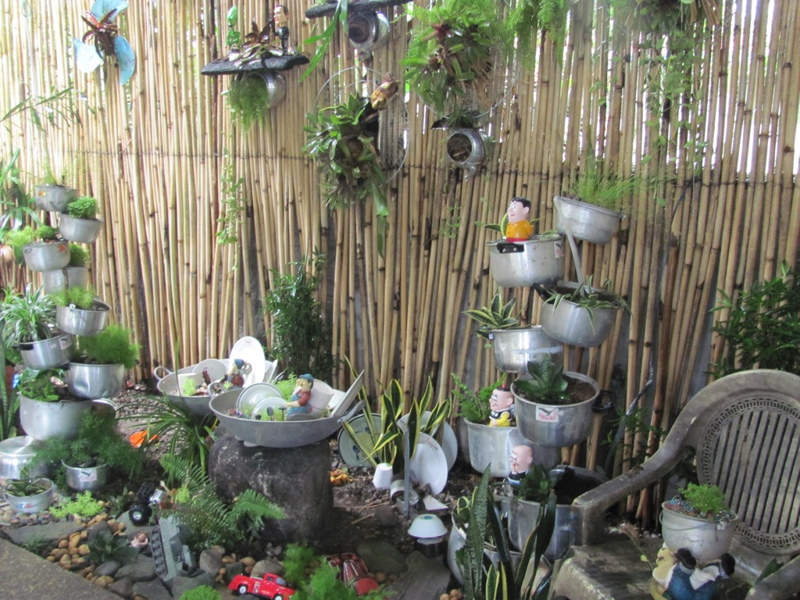 Recycling is one of the very best ways you can improve your garden, no matter what size or shape it is. 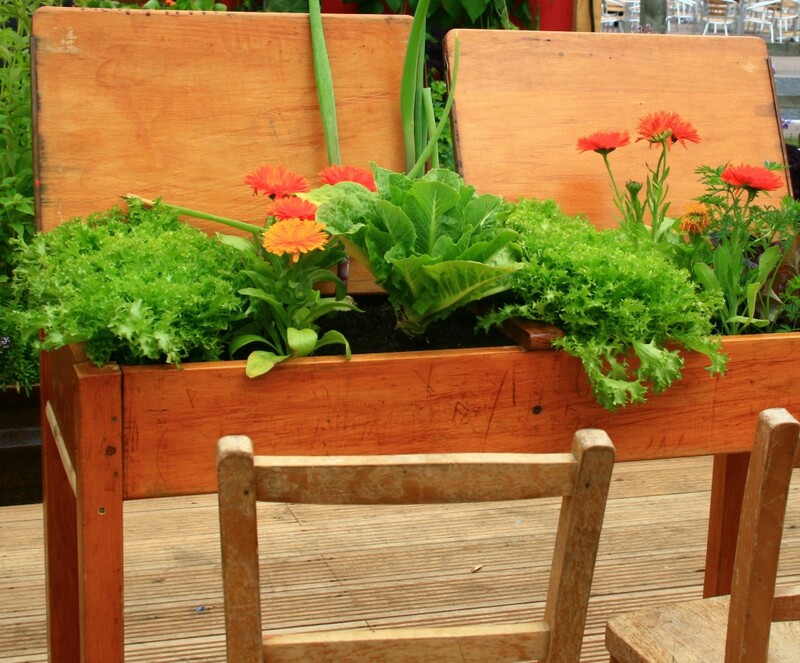 When you take some of the things that you’d throw away anyway and craft them into imaginative recycled planters for your garden, you’re helping the environment and sprucing up your home in the best way possible! 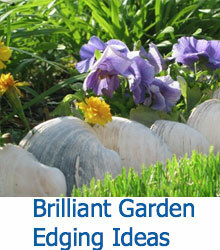 In one afternoon, you can improve your garden without spending a dime. 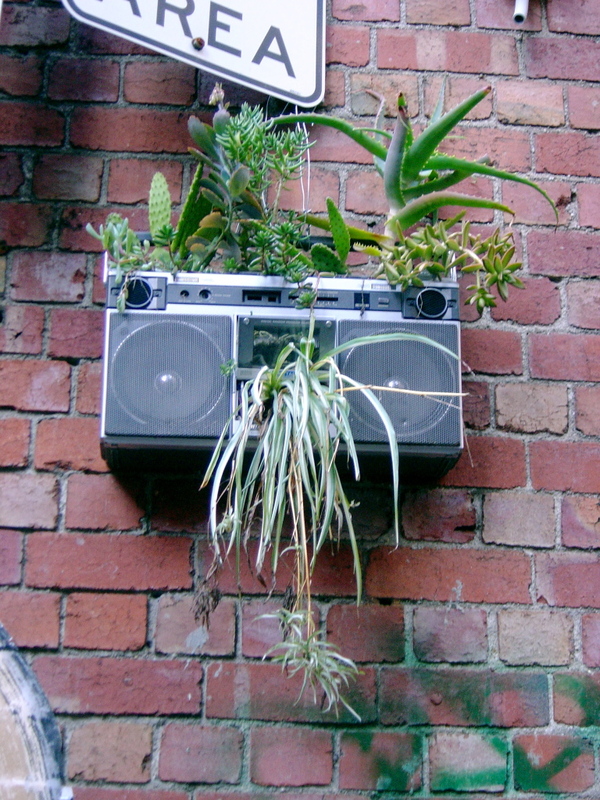 But what’s the very best part about using recycled possessions to make planters? Maybe it’s the space and money savings you’ll enjoy: reusing old items instead of purchasing new will help clear your house of clutter while saving cash. Maybe it’s the positive impact you bring to the environment, saving unused items a trip to the landfill and making them useful again. However, we believe that the sheer sense of joyful creativity makes recycling old objects into planters a fantastic idea for any gardener. 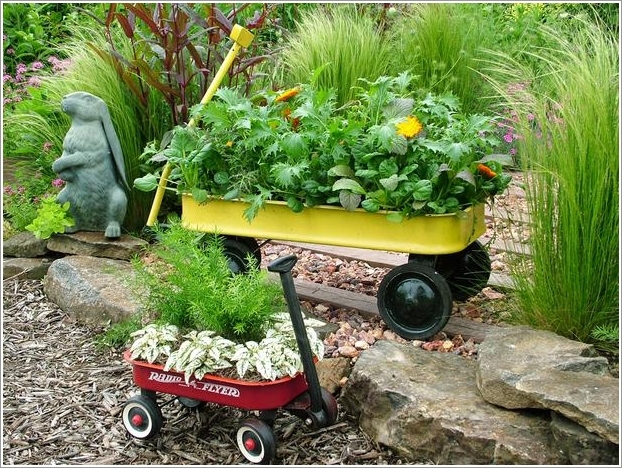 Wagons are perfect for a large bed of flowers, with abundant space and portability to spare. Try repainting the body to a new color if you’d like. 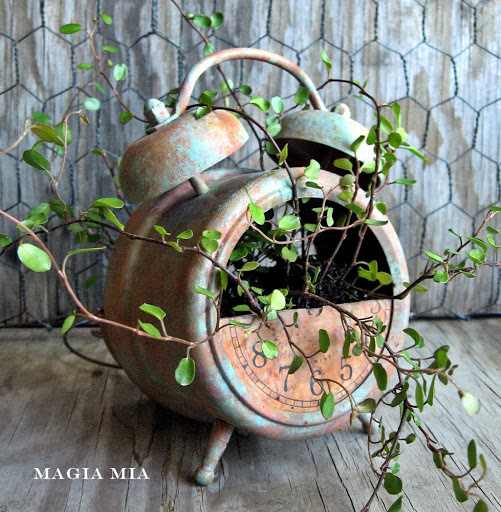 An old decorative teapot, like any solid open-topped container, makes for a great planter. Many of them have whimsical designs that would really stand out in a garden, and the handle makes for easy moving. Speaking of kitchenware, let’s take a look at these pot and pan planters. You can use a variety of sizes and shapes, and even combine them for a tippy-pot effect, as seen here. Have any old dressers that are no longer used? Try removing the drawers to make for fantastic containers. Some fresh paint alone will make them really pop. This fresh take on the small planter uses an old fashioned alarm clock, turning the inner structure into a perfect bed for your plants. The instructions are surprisingly simple! 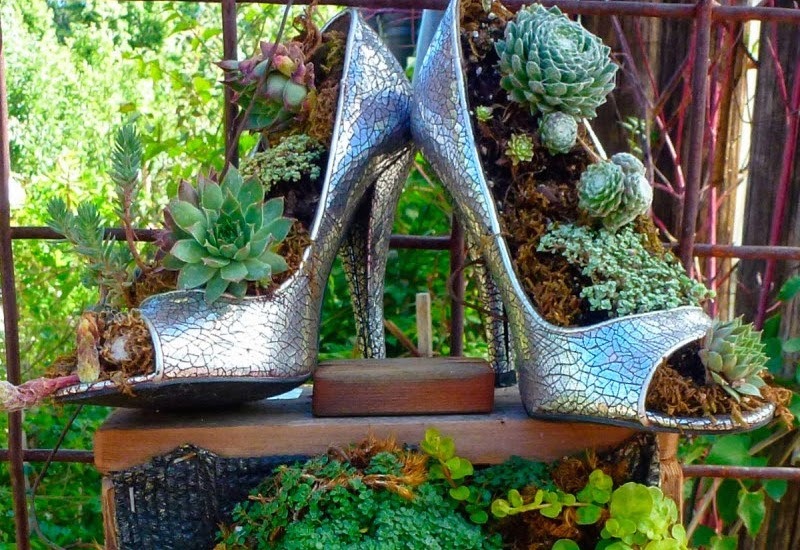 We mentioned footwear at the top of this article, and here’s a perfect example. Shoes or boots of any type will suffice, but old trainers are often abundant, crowding the bottoms of closets in many homes. 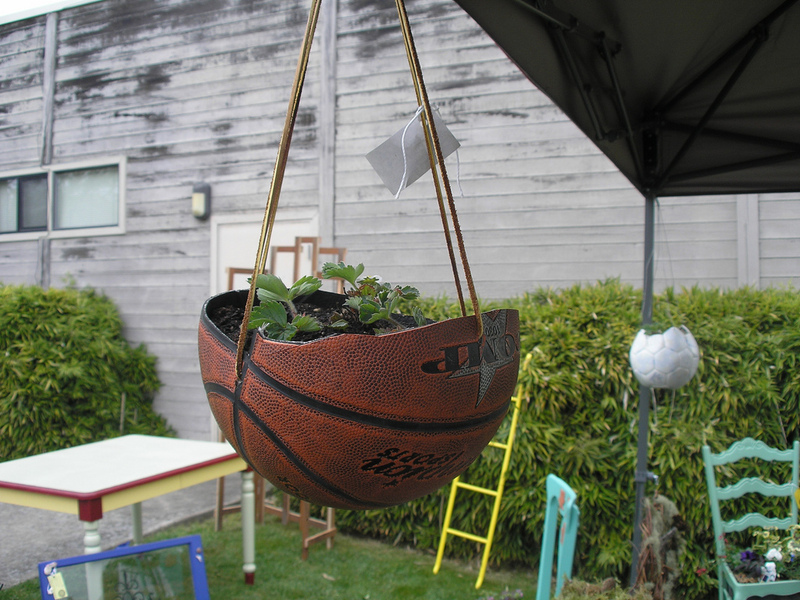 This basketball planter is a truly easy to make creation. Using just about any ball, a few simple cuts, and some rope or wire, you’ll have a fantastic hanging basket in no time! 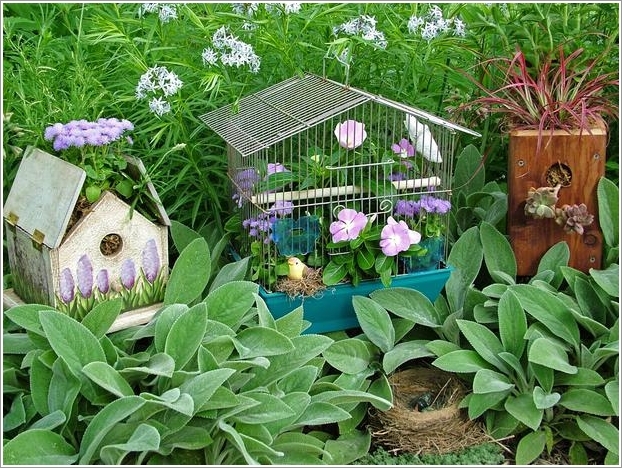 Both birdcages and bird houses make for fantastic planters. 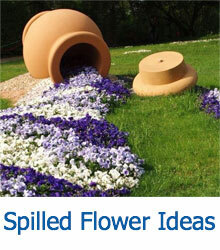 They’re ready-made containers and need only some cleaning and placement before being ready to host your flowers. 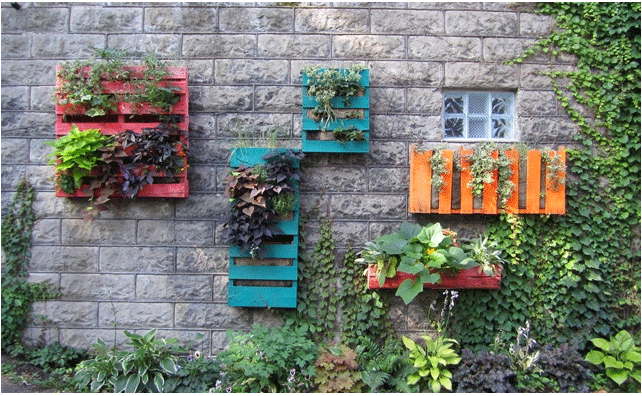 Pallets can be used in a surprisingly diverse amount of projects, not least of which is being part of a planter. This idea stood out to us in particular. Mountain the freshly painted pallets to an exterior wall allows for plant placement in a unique, rarely-used space. While this one may seem almost too obvious, it’s a great little addition to any garden, using a tool that’s already commonly associated with planting. 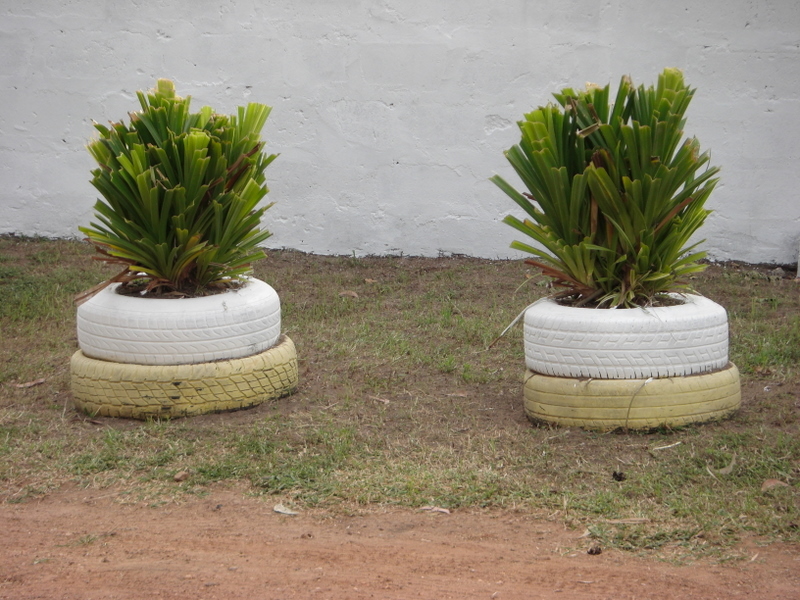 Tires can be reused in many different ways, with planters made from half-tires, hung tires, and more. 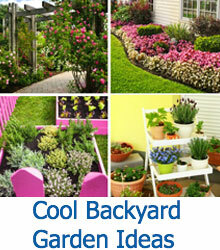 This idea simply involves painting them and creating stationary planters for large greenery. 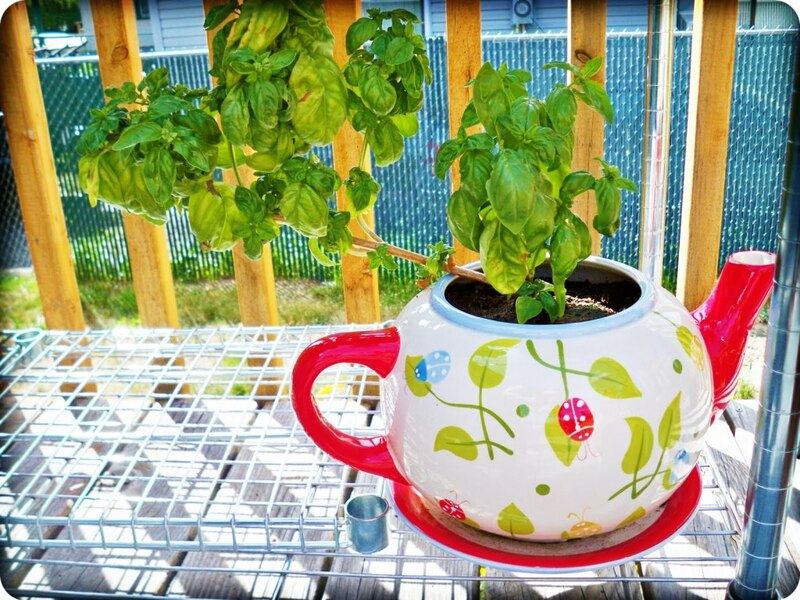 Colanders make for a surprisingly effective planter. With the draining holes at the bottom, they allow for sufficient watering while never worrying about drowning the plants. The variety of colors and sizes they appear in will give you many options for the garden. 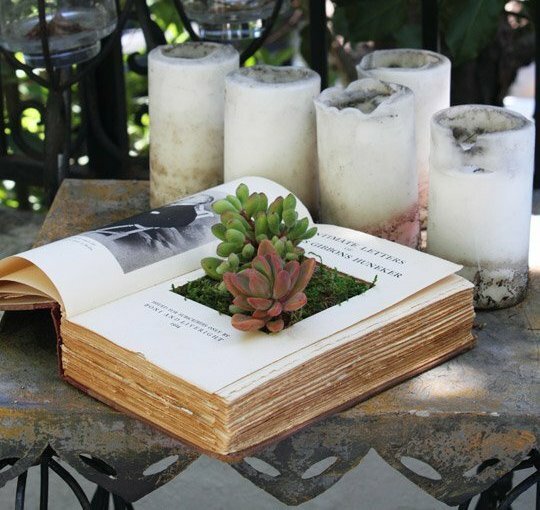 While a bit more involved than some of the projects on this list, the book planter is a truly spectacular idea, especially for those who hold reading near and dear to their hearts. 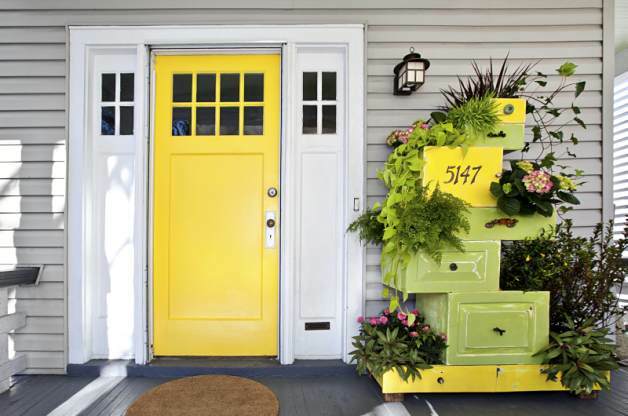 Portable, unique, and personalized, this is one of our favorite planter ideas. This is one of the cheekiest ideas we came across, and we couldn’t resist sharing. 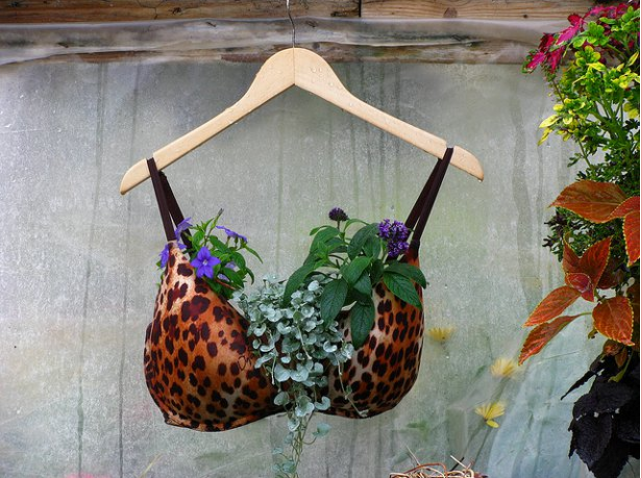 Using any old bra and hanger, you can create a hanging planter to add a bit of kitsch to your garden! 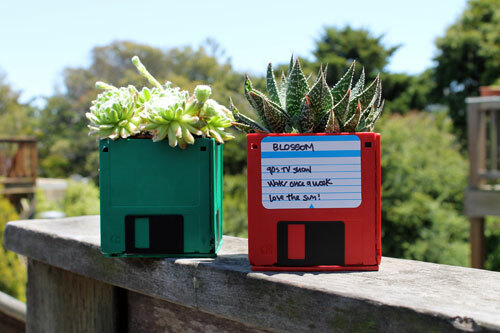 One of the most striking projects we’ve found involves tapping into your inner geek and using old 3.5″ computer disks to create perfect little planter cubes. The color combinations are limitless, and they provide ready-made labels! 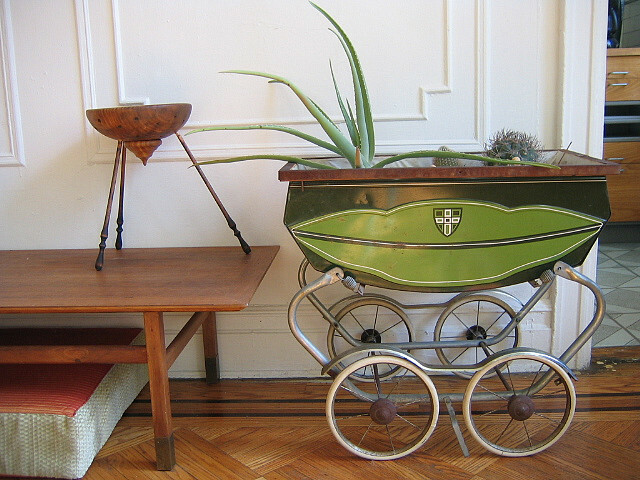 This project is perfect if you have an old stroller lying around, or if you find a classic model at a yard sale or secondhand store. Built-in portability and vintage style complete the look. 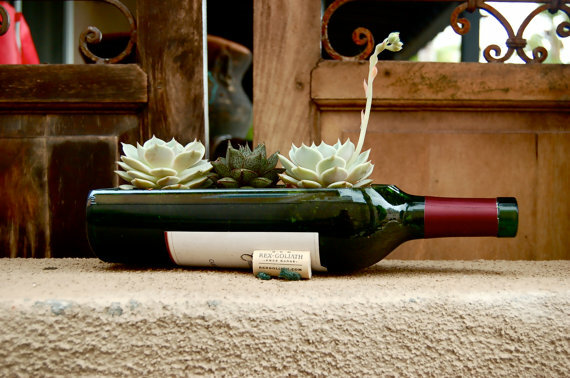 There are hundreds of pages describing wine bottle creations around the internet, but our favorite use so far is pictured below. Simple, elegant, and free, so long as you’ve already enjoyed the wine. Here’s another kitschy, fun project. 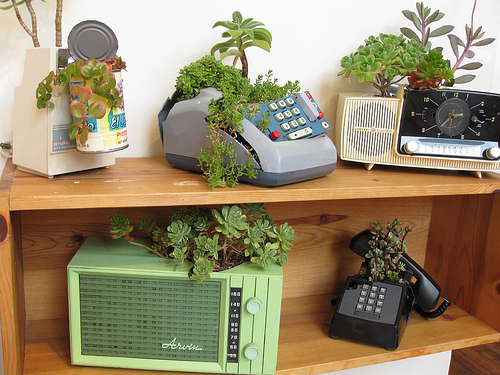 Turn any old electronics, from radios to telephones, into planters! It takes a bit of gutting and some elbow grease, but the look takes care of itself. Desks are already built with storage in mind. If you have old ones in your basement or find them at a yard sale, give them a chance! Very little work is required to make a perfect large planter. Finally, our last idea is one of the most convenient and fun projects. Using an old boombox (or other electronics) can allow you to hang a wall-mounted planner, saving space and money in the process. As you can see with this mere handful of ideas, there are an infinite variety of ways to craft your own planters out of everyday objects. 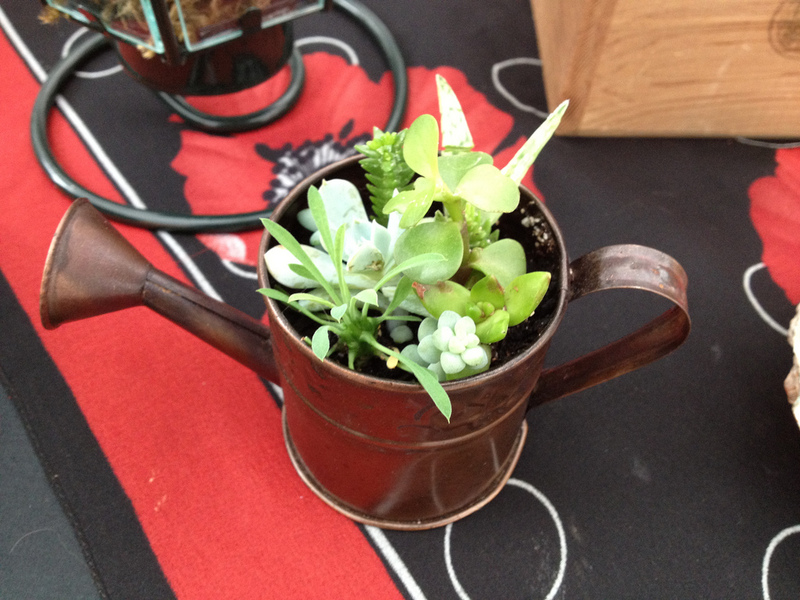 Take a look around your home or yard, or even check local thrift shops and yard sales for the perfect recycled planter. As the old adage goes, one man’s trash is another man’s treasure, so it goes for planters: what once was useless can flourish with the life of new plants!